X" marks the spot for amazing support and stability!X Ultra Prime Trail Shoes from Salomon are supportive, solidly built, and as eager to get outdoors as you are! They're technical marvels, loaded with good stuff, for a price that makes sense. Check 'em out... These feature Salomon's Advanced Chassis a lightweight "foot frame" sandwiched between the outsole and midsole, engineered to provide motion control, energy management, and a responsive fit and feel. Inside, an Ortholite insole provides supportive cushioning to keep you feeling good all day long. 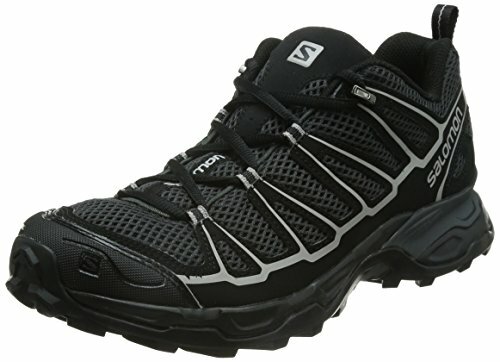 Lightweight, breathable, abrasion-resistant textile upper; Advanced Chassis: Salomon's lightweight "frame" is between the outsole and midsole, providing motion control, energy management, and push-through protection for an efficient, stable, responsive ride; Contagrip non-marking outsole uses the ideal combination of specialized rubber for optimal traction on a wide range of surfaces; Abrasion-resistant textile lining dries quickly and maintains breathability; Sensifit system works to cradle your foot for a precise, secure fit; Protective mud guard around the base of the shoes; Molded shank for underfoot support; Ortholite die-cut insole for supportive cushioning; Heel loop for easy on / off; Upper: Textile; Weight: Each approx. 15 oz. ; Mfg. Number: L37166300.